The VELscope® System is a revolutionary hand-held device that provides dentists, hygienists, and other oral health care professionals with an easy-to-use adjunctive mucosal examination system for the early detection of abnormal tissue. The VELscope System patented technology platform was developed by the British Columbia Cancer Agency in collaboration with MD Anderson Cancer Center, with funding provided in part by the NIH. It is based on the direct visualization of tissue fluorescence and the changes in fluorescence that occur when abnormalities are present. 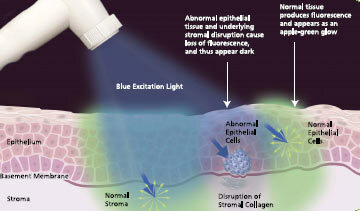 The VELscope System Handpiece emits a safe blue light into the oral cavity, which excites the tissue from the surface of the epithelium through to the basement membrane and into the stroma beneath, causing it to fluoresce. The clinician is then able to immediately view the different fluorescence responses to help differentiate between normal and abnormal tissue. In fact, the VELscopeSystem is the only adjunctive device cleared by the FDA and Health Canada to help discover oral mucosal lesions that might not be apparent or visible to the naked eye and to help surgeons determine the appropriate surgical margin for tumor excision. Under examination with the VELscope System, abnormal tissue typically appears as an irregular, dark area that stands out against the otherwise normal, green fluorescence pattern of surrounding healthy tissue. The incidence of oral cancer increased 11% in the United States in 2007. Unlike several other cancers, the survival rate for oral cancer has remained unchanged for decades. The overall 5-year survival rate for oral cancer is 52%, but when discovered early, it increases to 80% - 90%. Unfortunately, only 35% of oral cancer cases are diagnosed in the early stages. Why? Because there have been few advances made in screening techniques and there are significant limitations inherent to white light and chemiluminescence light examination of the oral mucosa. Pre-malignant changes actually start below the surface, at the basement membrane. These changes may not be apparent to the naked eye until the disease progresses to the surface. VELscope is intended to be used by a dentist or health-care provider as an adjunct to traditional oral examination by incandescent light to enhance the visualization of oral mucosal abnormalities that may not be apparent or visible to the naked eye, such as oral cancer or pre-malignant dysplasia. VELscope® is further intended to be used by a surgeon to help identify diseased tissue around a clinically apparent lesion and thus aid in determining the appropriate margin for surgical excision.